Indulge in the art of afternoon tea, steeped in history and the centrepiece of British culinary tradition, the ritual of afternoon tea is a familiarity enjoyed across the globe in some of the world’s finest and most luxurious establishments. Royal Crown Derby’s English fine bone china afternoon tea collections have long been at the heart of this time-honoured pastime, with its skilled craftspeople drawing on more than 260 years of experience to create the perfect tableware for the most refined and elegant afternoon tea experience. Take-a-look at the specially-selected collections chosen for you to indulge in your very own afternoon tea and celebrate with friends and family in style. 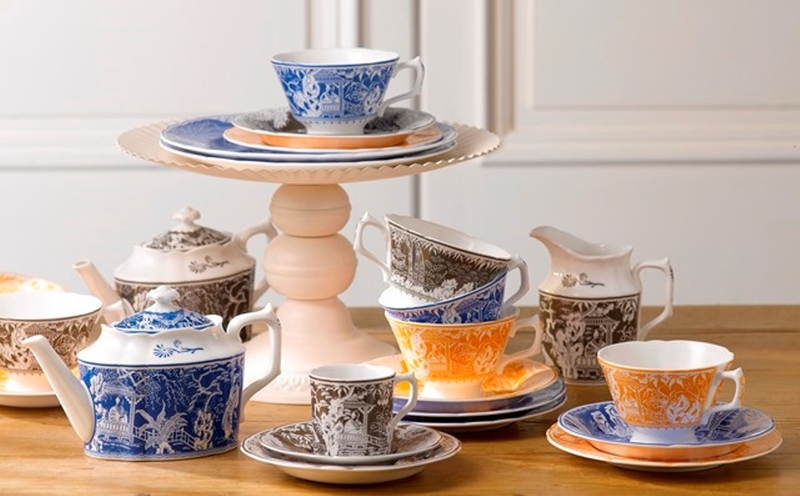 Quintessential British, the Royal Antoinette afternoon tea collection epitomizes traditional afternoon tea through it’s archetypal English pattern and elegant Royal fluted shape. Inspired by a pattern first created in the late 1800s, Royal Antoinette conjures up a characteristically English summer garden, with the intricately detailed pretty-pastel florals and lighter shade of polka dots in the design, incorporating 22ct gold edging around the fluted shape giving you the perfect elegance remaining as popular today as it was centuries ago. 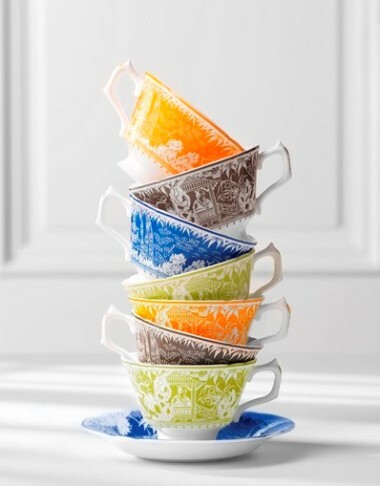 View the Royal Antoinette Afternoon Tea Collection here. Exemplifying the skill of Royal Crown Derby’s artisans whilst showcasing design excellence through the lavish hand applied 22ct gold. 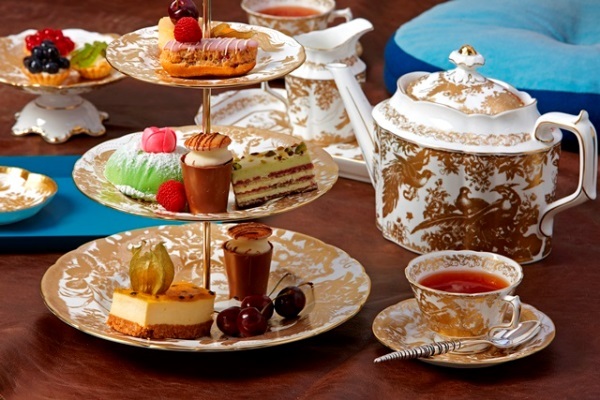 Aves Gold is an opulent and indulgent pattern that will elevate any afternoon tea pastime. Adapted from a 1932 embroidery pattern taken from Royal Crown Derby’s historic archives, the Aves Gold collection, also offered in the alternative decoration in platinum, is adorned with dramatic birds of paradise and peacocks with finely illustrated trailing feather work. 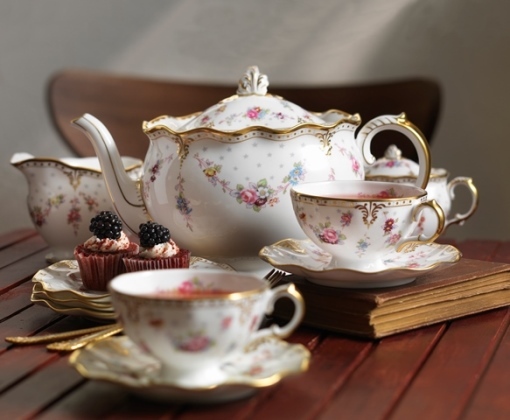 View the Aves Gold Afternoon Tea collection here. The contemporary and playful pastels of the Darley Abbey Harlequin design is a modern interpretation of the Regency-style simplicity of Royal Crown Derby’s complementary classic soft green damask colour of the Darley Abbey archive pattern inspired by delicate lines and intricate curves representing twirling foliage and filigree leaves combined with 22ct gold. Darley Abbey Harlequin is available in pretty pastel shades of Baby Pink, Darley Abbey Green, Lavender and Duck Egg and is expertly hand-finished in 22-carat-gold with a plate 21.5cm , teacup and saucer offered in each colourway. The Mikado pattern is a bright and contemporary take on a distinctive pattern which dates back to 1894. Working with the same romantic scenes, each piece beautifully tells the different chapters of the best loved Mikado Opera story through intricate patterns in breath-taking detail and invigorated design through stunning pops of colour. The result is a directional piece of ware with a remarkable legacy at its heart. View the Mikado collection here. The Royal Crown Derby 1750 Tea Room at the Osmaston Road site in Derby will be offering an 'Afternoon Tea Your Way' during the 14th to 20th August to celebrate National Afternoon Tea Week. 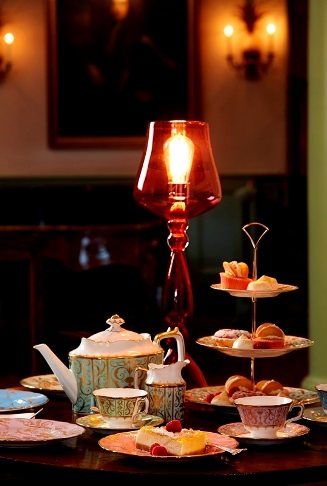 Select your own afternoon tea with a special menu choice offered at £25.00 for two.